Once upon a time, not so long ago, people built palaces instead of boxes in which to showcase their wares. It wasn’t just movie theaters that were transporting. Auto showrooms, like the Arnold Brother’s dealership above, were the stuff dreams were made of. In 1925, tile merchant Robert Howden, Sr built a legacy for himself — The Howden Building — a glittering, shimmering, jewelry box of a tile showroom in Oakland, California. 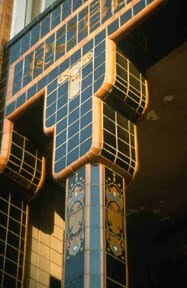 The building’s exterior is clad in American Encaustic tiling Co. (AET) and Solon & Schemmel (S&S) tiles. Inside, you’ll find Batchelder, Claycraft, S&S and Oakland’s own Muresque Tiles. Howden did much of the tiling himself; that the building has survived intact serves as a tribute to his legacy and underscores the efforts by the current owners to preserve the space and its historic tilework. On Sunday, September 12th, The Tile Heritage Foundation is presenting “Clay Expectations: A Festival of Tiles and Mosaics” at the historic Howden. And what a festival it is! This event is being done as a fundraiser for THF — a mere $5 will get you into the party and enable you to participate in it all, with the exception of the tour which has a very worthwhile $10 fee attached to it. It is a cultural bargain, thanks to event sponsors Howden Building Investors and LCB Associates of Oakland, California. Mosaic: Internationally recognized mosaic artist and teacher Elizabeth Raybee will orchestrate a “drop in” for kids of all ages to make mini-mosiacs. Among the choices will be mosaic pins or fridge magnets made of jar lids or anchovy/sardine cans. Lots of fun and glitter! Everyone can take away a finished piece. Clay: Tile Heritage is also providing a supervised Kids’ Clay Table all day with well known ceramicists and teachers: Irene de Watteville, Dale Wiley, Lisa Cox, Chere Mah and Collete Crutcher. There will be lots of lay tools, stamps, molds and hands-on guidance for these talented teachers. Everyone can take home what they make! Thank you Clay Tile Roof! We love what we do here. Come back again and keep commenting. It's always great to hear the voices of readers. Awesome Post!I love your blog this is seriously amazing…Thanks for sharing. Cool to see these artistic tiles. Mosaic Bouquet really caught my attention. It has a touch of Egyptian art and it's very simple. For sure, it will fit to any bathroom tile design. Not-to-be missed really says it. Amazing event, and you've compiled a wonderful set of images, Nancie.